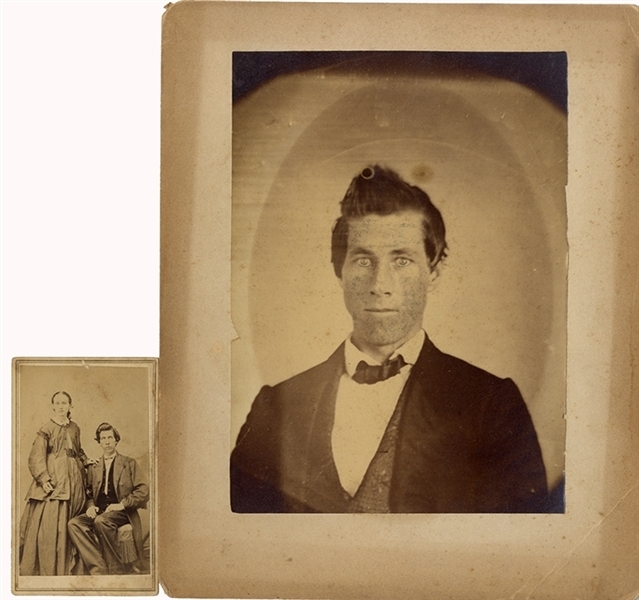 A pair of photographs for Henry M. Ellis who enlisted 7.1.1861 as a Captain into H Company, Arkansas 13th Infantry. he was captured August 25, 1863 by Union picket boat and was sent to Johnson’s Island, then New Orleans and was paroled February 1865. The first photo is a mounted albumen, 5-1/2” x 7-1/4” to larger mount. Ellis is in civilian attirecoat, vest and tie. ... plus, CDV of a seated Ellis with his wife standing by his side. Backmark, Bingham & Bros. gallery, Memphis, with 3c revenue stamp. Both VG.